These highlights do not include all the information needed to use TREMFYA safely and effectively. See full prescribing information for TREMFYA. To report SUSPECTED ADVERSE REACTIONS, contact Janssen Biotech, Inc. at 1-800-JANSSEN (1-800-526-7736) or FDA at 1-800-FDA-1088 or www.fda.gov/medwatch. Administer TREMFYA subcutaneously. 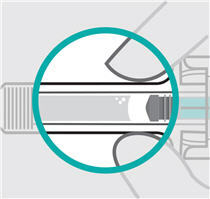 Each prefilled syringe or One-Press injector is for single-dose only. 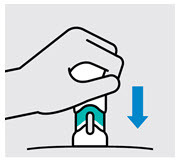 Instruct patients to inject the full amount (1 mL), which provides 100 mg of TREMFYA. TREMFYA is contraindicated in patients with a history of serious hypersensitivity reaction to guselkumab or to any of the excipients [see Warnings and Precautions (5.3)]. TREMFYA may increase the risk of infection. In clinical trials, infections occurred in 23% of subjects in the TREMFYA group versus 21% of subjects in the placebo group through 16 weeks of treatment. Upper respiratory tract infections, gastroenteritis, tinea infections, and herpes simplex infections occurred more frequently in the TREMFYA group than in the placebo group [see Adverse Reactions (6.1)]. The rate of serious infections for the TREMFYA group and the placebo group was ≤ 0.2%. Treatment with TREMFYA should not be initiated in patients with any clinically important active infection until the infection resolves or is adequately treated. Serious hypersensitivity reactions have been reported with postmarket use of TREMFYA. Some cases required hospitalization. If a serious hypersensitivity reaction occurs, discontinue TREMFYA and initiate appropriate therapy. Data from two placebo- and active-controlled trials (VOYAGE 1 and VOYAGE 2) in 1441 subjects (mean age 44 years; 70% males; 82% white) were pooled to evaluate the safety of TREMFYA (100 mg administered subcutaneously at Weeks 0 and 4, followed by every 8 weeks). In the 16-week placebo-controlled period of the pooled clinical trials (VOYAGE 1 and VOYAGE 2), adverse events occurred in 49% of subjects in the TREMFYA group compared to 47% of subjects in the placebo group and 49% of subjects in the U.S. licensed adalimumab group. Serious adverse events occurred in 1.9% of subjects in the TREMFYA group (6.3 events per 100 subject-years of follow-up) compared to 1.4% of subjects in the placebo group (4.7 events per 100 subject-years of follow-up), and in 2.6% of subjects in U.S. licensed adalimumab group (9.9 events per 100 subject-years of follow-up). Upper respiratory infections include nasopharyngitis, upper respiratory tract infection (URTI), pharyngitis, and viral URTI. Headache includes headache and tension headache. 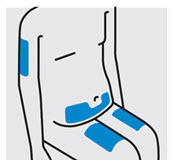 Injection site reactions include injection site erythema, bruising, hematoma, hemorrhage, swelling, edema, pruritus, pain, discoloration, induration, inflammation, and urticaria. Gastroenteritis includes gastroenteritis and viral gastroenteritis. Tinea infections include tinea pedis, tinea cruris, tinea infection, and tinea manuum infections. Herpes simplex infections include oral herpes, herpes simplex, genital herpes, genital herpes simplex, and nasal herpes simplex. Infections occurred in 23% of subjects in the TREMFYA group compared to 21% of subjects in the placebo group. The following adverse reactions have been reported during post-approval of TREMFYA. Because these reactions are reported voluntarily from a population of uncertain size, it is not always possible to reliably estimate their frequency or establish a causal relationship to TREMFYA exposure. Avoid use of live vaccines in patients treated with TREMFYA [see Warnings and Precautions (5.3)]. Upon initiation of TREMFYA in patients who are receiving concomitant CYP450 substrates, particularly those with a narrow therapeutic index, consider monitoring for therapeutic effect or drug concentration and consider dosage adjustment as needed [see Clinical Pharmacology (12.3)]. There are no available data on TREMFYA use in pregnant women to inform a drug associated risk of adverse developmental outcomes. Human IgG antibodies are known to cross the placental barrier; therefore, TREMFYA may be transmitted from the mother to the developing fetus. In a combined embryofetal development and pre- and post-natal development study, no adverse developmental effects were observed in infants born to pregnant monkeys after subcutaneous administration of guselkumab during organogenesis through parturition at doses up to 30 times the maximum recommended human dose (MRHD). Neonatal deaths were observed at 6- to 30-times the MRHD (see Data). The clinical significance of these nonclinical findings is unknown. In a combined embryofetal development and pre- and post-natal development study, pregnant cynomolgus monkeys were administered weekly subcutaneous doses of guselkumab up to 50 mg/kg (30 times the MRHD based on a mg/kg comparison) from the beginning of organogenesis to parturition. 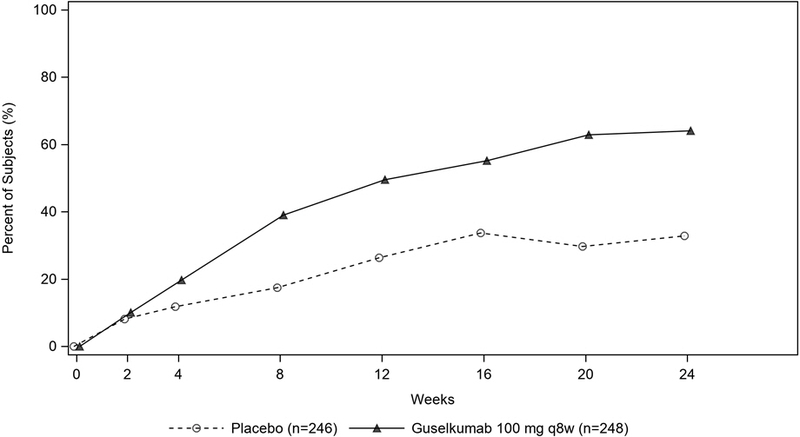 Neonatal deaths occurred in the offspring of one control monkey, three monkeys administered guselkumab at 10 mg/kg/week (6 times the MRHD based on a mg/kg comparison) and three monkeys administered guselkumab at 50 mg/kg/week (30 times the MRHD based on a mg/kg comparison). The clinical significance of these findings is unknown. No guselkumab-related effects on functional or immunological development were observed in the infants from birth through 6 months of age. Of the 1823 subjects with plaque psoriasis exposed to TREMFYA, a total of 98 subjects were 65 years or older, and 6 subjects were 75 years or older. No overall differences in safety or effectiveness were observed between older and younger subjects who received TREMFYA. However, the number of subjects aged 65 years and older was not sufficient to determine whether they respond differently from younger subjects [see Clinical Pharmacology (12.3)]. In the event of overdosage, monitor the patient for any signs or symptoms of adverse reactions and administer appropriate symptomatic treatment immediately. TREMFYA (guselkumab) injection is a sterile, preservative free, clear, colorless to light yellow solution that may contain small translucent particles. 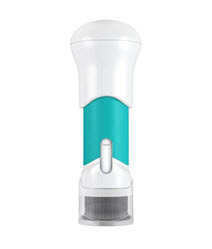 TREMFYA is supplied as a single-dose solution in a 1 mL glass syringe with a 27G, half inch fixed needle assembled in a passive needle guard delivery system or One-Press patient-controlled injector for subcutaneous use. Each TREMFYA 1 mL prefilled syringe or One-Press patient-controlled injector contains 100 mg guselkumab, L-histidine (0.6 mg), L-histidine monohydrochloride monohydrate (1.5 mg), polysorbate 80 (0.5 mg), sucrose (79 mg) and water for injection at pH 5.8. The effects of guselkumab on the pharmacokinetics of midazolam (metabolized by CYP3A4), warfarin (metabolized by CYP2C9), omeprazole (metabolized by CYP2C19), dextromethorphan (metabolized by CYP2D6), and caffeine (metabolized by CYP1A2) were evaluated in an exploratory study with 6 to 12 evaluable subjects with moderate-to-severe plaque psoriasis. Changes in AUCinf of midazolam, S-warfarin, omeprazole, and caffeine after a single dose of guselkumab were not clinically relevant. For dextromethorphan, changes in AUCinf after guselkumab were not clinically relevant in 9 out of 10 subjects; however, a 2.9-fold change in AUCinf was observed in one individual [see Drug Interactions (7.2)]. Four multicenter, randomized, double-blind trials (VOYAGE 1 [NCT02207231], VOYAGE 2 [NCT02207244], NAVIGATE [NCT02203032], and ORION [NCT02905331]) enrolled subjects 18 years of age and older with moderate-to-severe plaque psoriasis who were eligible for systemic therapy or phototherapy. Subjects had an Investigator's Global Assessment (IGA) score of ≥3 ("moderate") on a 5-point scale of overall disease severity, a Psoriasis Area and Severity Index (PASI) score ≥12, and a minimum affected body surface area (BSA) of 10%. Subjects with guttate, erythrodermic, or pustular psoriasis were excluded. NAVIGATE evaluated the efficacy of 24 weeks of treatment with TREMFYA in subjects (N=268) who had not achieved an adequate response, defined as IGA ≥2 at Week 16 after initial treatment with U.S. licensed ustekinumab (dosed 45 mg or 90 mg according to the subject's baseline weight at Week 0 and Week 4). These subjects were randomized to either continue with U.S. licensed ustekinumab treatment every 12 weeks or switch to TREMFYA 100 mg at Weeks 16, 20, and every 8 weeks thereafter. Baseline characteristics for randomized subjects were similar to those observed in VOYAGE 1 and VOYAGE 2. Store in a refrigerator at 2ºC to 8ºC (36ºF to 46ºF). 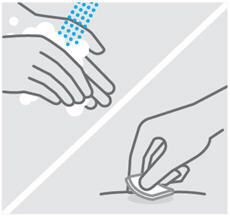 Instruct patients of the importance of communicating any history of infections to the healthcare provider and contacting their healthcare provider if they develop any symptoms of an infection [see Warnings and Precautions (5.1)]. 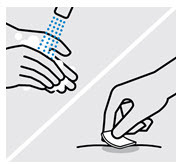 Advise patients to discontinue TREMFYA and seek immediate medical attention if they experience any symptoms of serious hypersensitivity reactions [see Warnings and Precautions (5.3)]. 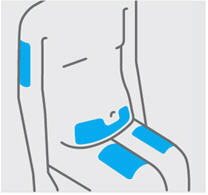 Instruct patients or caregivers to perform the first self-injection under the supervision and guidance of a qualified healthcare professional for proper training in subcutaneous injection technique. 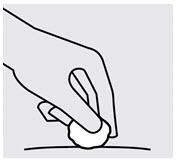 Instruct patients who are self-administering to inject the full dose of TREMFYA [see Medication Guide and Instructions for Use]. See "What are the possible side effects of TREMFYA?" for more information about side effects. Do not use TREMFYA if you have had a serious allergic reaction to guselkumab or any of the other ingredients in TREMFYA. See the end of this Medication Guide for a complete list of ingredients in TREMFYA. have any of the conditions or symptoms listed in the section "What is the most important information I should know about TREMFYA?" 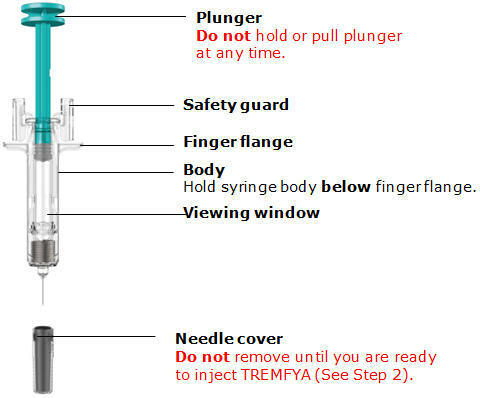 See the detailed "Instructions for Use" that comes with TREMFYA for information on how to prepare and inject a dose of TREMFYA, and how to properly throw away (dispose of) used TREMFYA prefilled syringes or One-Press injectors. See "What is the most important information I should know about TREMFYA?" What are the ingredients in TREMFYA? For more information, call 1-800-526-7736 or go to www.tremfya.com. 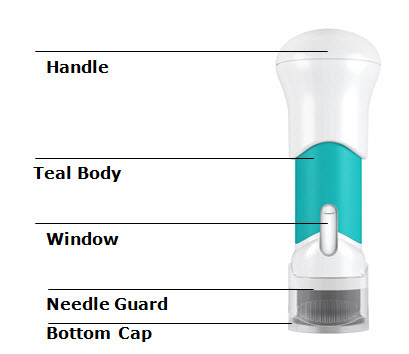 TREMFYA comes as a single-dose prefilled syringe containing one 100 mg dose. 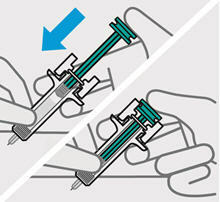 Each TREMFYA prefilled syringe can only be used one time. 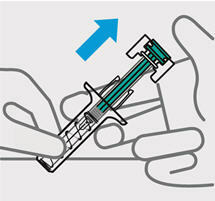 Throw the used prefilled syringe away (See Step 3) after one dose, even if there is medicine left in it. Do not reuse your TREMFYA prefilled syringe. 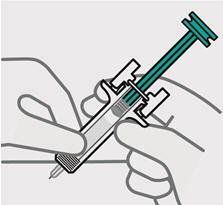 If your healthcare provider decides that you or a caregiver may be able to give your injections of TREMFYA at home, you should receive training on the right way to prepare and inject TREMFYA using the prefilled syringe before attempting to inject. 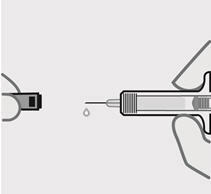 Do not try to inject yourself until you have been shown the right way to give the injections by your healthcare provider. 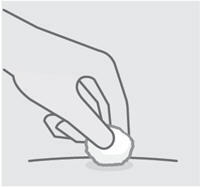 Read this Instructions for Use before using your TREMFYA prefilled syringe and each time you get a refill. There may be new information. This leaflet does not take the place of talking with your healthcare provider about your medical condition or your treatment. 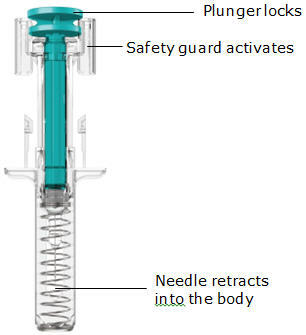 The TREMFYA prefilled syringe is intended for injection under the skin, not into the muscle or vein. 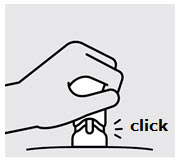 After injection, the needle will retract into the body of the device and lock into place. Store in refrigerator at 36° to 46°F (2° to 8°C). 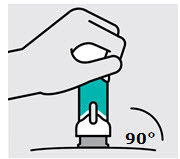 Do not freeze TREMFYA prefilled syringe. Keep TREMFYA prefilled syringe and all medicines out of reach of children. Do not shake your TREMFYA prefilled syringe. 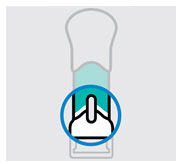 Keep TREMFYA prefilled syringe in the original carton to protect from light and physical damage. 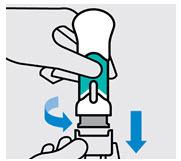 Remove your TREMFYA prefilled syringe carton from the refrigerator. 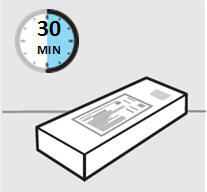 Keep the prefilled syringe in the carton and let it sit on a flat surface at room temperature for at least 30 minutes before use. Check the expiration date ('EXP') on the back panel of the carton. Do not inject TREMFYA if the perforations on the carton are broken. Call your healthcare provider or pharmacist for a refill. Do not inject into skin that is tender, bruised, red, hard, thick, scaly or affected by psoriasis. Take your TREMFYA prefilled syringe out of the carton. Check the TREMFYA prefilled syringe liquid in the viewing window. It should be clear to slightly yellow and may contain tiny white or clear particles. You may also see one or more air bubbles. This is normal. 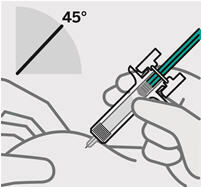 Inject TREMFYA within 5 minutes of removing the needle cover. Do not use a TREMFYA prefilled syringe if it is dropped. Call your healthcare provider or pharmacist for a refill. 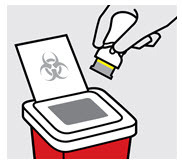 Put your used TREMFYA prefilled syringe in an FDA-cleared sharps disposal container right away after use. 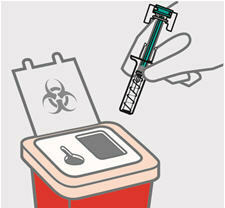 Do not throw away (dispose of) your TREMFYA prefilled syringe in your household trash. 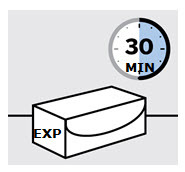 Check the expiration date ('EXP') on the carton. 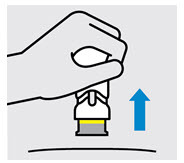 For more information, see "How should I dispose of the used One-Press injector? ".